Nepal is a dynamic country with harsh environmental and geographical extremes—from the cold high mountains in the north to the hot low plains in the south. For those communities living in the mountainous regions, farming is a challenge. The soils are often poor and the fields are carefully managed terraces on steep mountainsides. In March 2012, a team from Australia, the Philippines, and Nepal visited the Dhand Chaur village in the mountainous Dholakha District of Nepal and found a farmer there had been producing and utilizing biochar for at least two generations as part of her regular farming routine. The team was part of a fact finding mission for a proposed Asian Development Bank Project and was visiting Tamang households in the region to study ecological approaches to the issues of food security and climate change adaptation in Nepal. The village itself is mainly poor and socially marginal. Villagers manage to produce enough food for six months in advance and make up the rest of their needs through daily wage laboring. Many rural men from Nepal spend time outside the country looking for work, which means rural areas are dominated by women who are also the primary farmers. Though the farms produce millet, maize, and potatoes as the major crops, only potatoes are sold in the market. While the team was visiting the village, they interviewed 48 year old Bhakta Kumari Tamang and found that producing and using biochar was a component of her farming practice. She keeps chickens, goats and a buffalo and collects much of the fodder and wood used for cooking from the surrounding mountains. It takes her about 15 full days per month during the dry season, which runs from October to January, to collect enough fodder and wood to last the whole year. She has primary responsibility for the family fields and uses a system of producing biochar in the fields in simple mounds. To create the biochar, she digs up soil in an area greater than 5 sq meters. Straw and grass is then laid on top of the soil and smoldering dried cow/buffalo dung cakes mixed with straw are then laid on top of the residue. More twigs and leaves are placed on top of the dung, which is then covered by soil, steadily creating a mound. The dung slowly smolders for three days, transforming the biomass to biochar, and changing the dark brown soil to a lighter reddish color. She then works the charred material into the ground and then leaves it for three weeks before planting millet seeds. By this time, the soil gives off a very slight smell of pyroligneous acids. Bhakta Kumari Tamang said the millet may not germinate and the seeds may not set if the charred biomass is not well incorporated into the soil. If germination is a slow, she adds a little urea to the soil. Once the millet is harvested, she grows either wheat or potatoes in the same soil and biochar. Some of the research team collected biochar and soil from a field where this treatment had been applied approximately three weeks previously. They separated out a micaceous mineral, the soil, and two types of biochar in de-mineralized water. The team deduced that the floating biochar particles that had a diameter of less than 1 mm were probably produced from the straw, leaves, and dung and that the larger fraction that sank was probably produced from the pyrolysis of branches and twigs. They carried out initial characterization using a scanning electron microscope (SEM) with the ability to perform elemental analysis by energy dispersive x-ray spectroscopy (EDS). Using biochar to supplement the soil and ensure livelihoods has served Bhakta Kumari Tamang and her family over several generations to improve the family fields and increase the crop production in her area. To learn more about the Asian Development Bank project in Nepal, please see: http://pid.adb.org/pid/TaView.htm?projNo=46118&seqNo=01&typeCd=2. 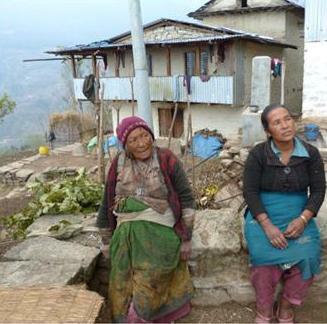 Village setting in the Dhand Chaur Area; photos courtesy of the authors. 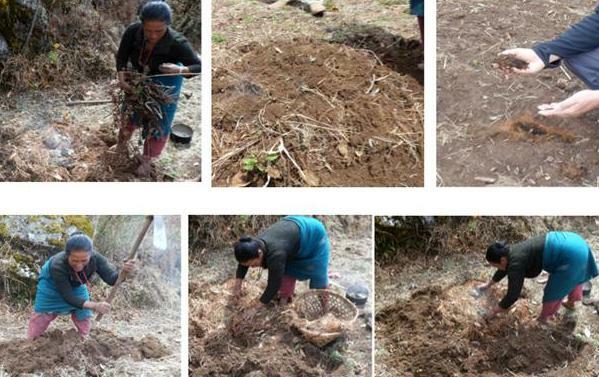 Bhakta Kumari Tamang, showing the traditional method of making biochar in a mound. 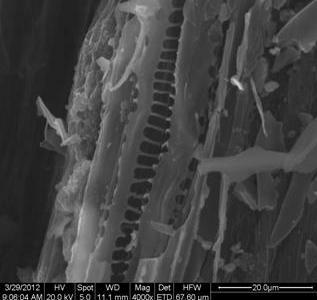 SEM image that shows the structure of biochar produced from straw. The associated EDS spectrum shows there is a range of minerals (K, Ca, Mn, S, P, Si and Al) present on the surface of the straw. The presence of some of these minerals may have resulted from interactions with the clay in the soil and the cow manure during pyrolysis. 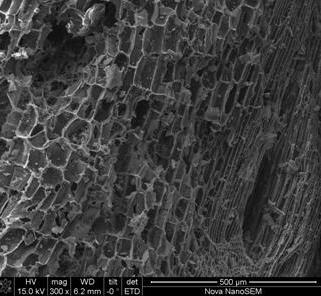 SEM image of a piece of wood-based biochar. EDS analysis identified mineral phases on the surface that have significant concentrations of Al, Si, Ca, K, P, and Fe (a similar range of minerals to those identified in the preceeding image). It is probable that deposition of these elements on the surface of the woody substances occurred during the pyrolysis process.